These past few weeks have been really busy, with school, online business, work, family and church ministry just piling on top of each other. I am currently a preschool teacher three days a week and a full-time student the rest of the time. I teach four and five-year old students and lately our center has been a hubbub of learning and fun chaos. Most of my free time is delegated on church and ministry, family and an online business I am trying to get started to have some extra cash on the side. Needless to say, it has been a really adventurous few weeks. Monday was my all time low so far, spilling my coffee on the roof of my car (don’t ask) and barely getting to eat half a banana on the way to work. It was a brutal day and it ended with me being very frustrated and feeling very impatient, impatient enough to even mutter at my car! As you can see, it was a low moment and not one of my proud ones. I am, in some ways, a very detail-oriented perfectionist. My days run by a strict schedule in my head and output is criticized by how well it is presented and how well it is received. Far too often than not, this causes a struggle in my daily walk of faith. When I get distracted by the worries of this world, it becomes somewhat natural to evaluate everything just based on what I do and how I do it. It becomes easy to focus on me and more difficult to have a heart that solely is focused on Christ. Notice how beautiful the psalmist paints a picture of a tree that never thirsts and never withers all because it has an all-powerful Source that it’s connected to. Like our hearts, whose very nature is to find comfort and wander idly in the world, it is a blessing knowing that reviving is what Christ does through the Holy Spirit. Reviving our hearts and spurring us on to a life lived to glorify Christ in any and every way is just one of the many things we can enjoy as Christian women. May our lives and hearts be ever fixed on You. This life is so busy and it is very easy to get distracted and discouraged but we thank You for Your ever-abounding grace that spurs us on. 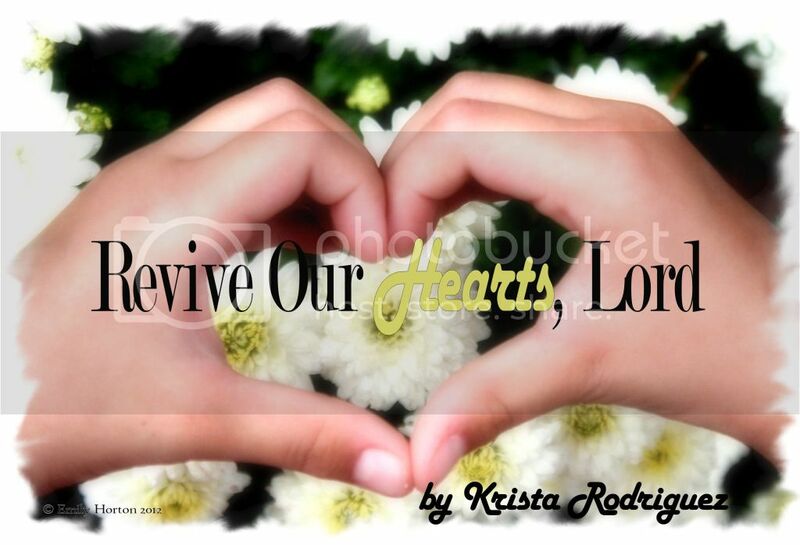 May You revive our hearts - that any distraction be replaced with a desire to glorify God. May You revive our families and friends who need the comfort and peace of the Spirit as well. May You revive our churches that we all grow in Spirit and in Truth. Lastly, please revive our country as well as other countries in the world to fear You, love You and live for You knowing that conviction from the Holy Spirit brings about true repentance. In Your name, Amen. Thank you for this helpful article and heartfelt prayer. You're welcome Jenna. God is our ever present help in any time of need. It's an amazing truth (the extent of His love) to embrace. May God bless you. How may we pray for you? That was a helpful article. It becomes easy to focus on me and more difficult to have a heart that solely is focused on Christ.